Given by Citibank, its landlord the Prudential Assurance Company, and the Greater London Council. The Spirit of Gaiety was designed for the dome of the second Gaiety Theatre in London, which opened in October 1903 on the Aldwych-Strand corner, the first Gaiety having been demolished to make way for reconstruction of the Aldwych. The angel was erected in March 1904. The new theatre was built by George Edwardes (1852-1915) who had run the Gaiety since 1896. It was designed by the architect George Runtz (1859-1913) and on either side of the proscenium arch featured sculptures of Music and Dancing by Hibbert Binney, the sculptor of the angel. Runtz liked the conjunction of sculpture and architecture and also incorporated a bronze figure group by Binney into a later work, the Norwich Union building in Piccadilly which Runtz designed in 1907. The second Gaiety Theatre closed in 1939 because of a proposed scheme for widening the approaches to Waterloo Bridge. It was eventually demolished in 1957 when the angel was removed in July. English Electric House, now Citibank House, was built on the site. 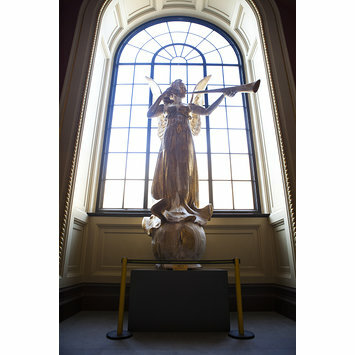 Hibbert's angel was preserved however and stood in the well of the Citibank's premises in the Aldwych. It was presented to the Theatre Museum by its joint owners in 1984. Carved solid teak angel with gilding on a gesso base, holding a trumpet to her lips. The angel stands on a teak gilt ball which in turn stands on a circular concrete base with rough rendering beneath, in the centre of which is a large iron pin. The second Gaiety Theatre closed in 1939 because of a proposed scheme of widening the approaches to Waterloo Bridge. It was eventually demolished in 1957 when the angel was removed in July. English Electric House, now Citibank House, was built on the site. Hibbert's angel was preserved however and stood in the well of the Citibank's premises in the Aldwych. It was presented to the Theatre Museum by its joint owners in 1984. 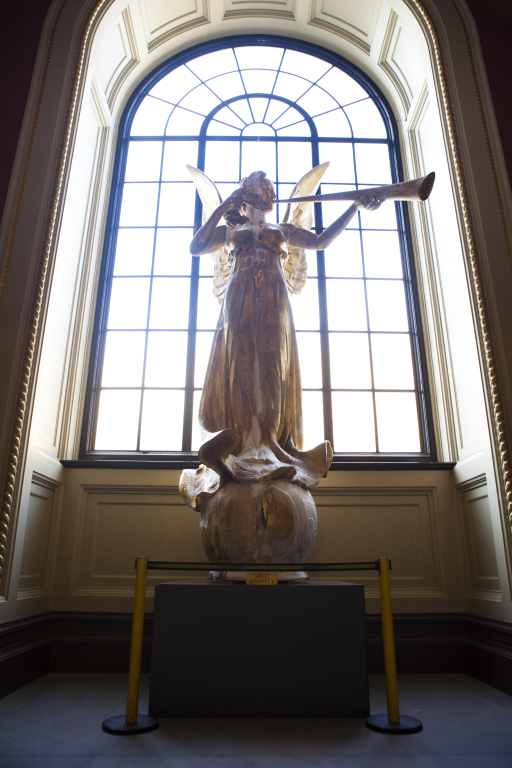 It was restored by the V&A's gilder Malcolm Green who remembered being told by the V&A's former Master Gilder, Albert Payne, of the time he spent as a young apprentice re-gilding the angel on top of the Gaiety Theatre, working on scaffolding. This must have been in 1904 after the damage occurred hoisting the angel in place. Gilded teak angel by Hibbert C, Binney known as The Spirit of Gaiety and originally designed for the dome of the first Gaiety Theatre, Aldwych, where it was erected in March 1904.